Wainwright's : Yoke, Ill Bell, Froswick, Thornthwaite Crag, Mardale Ill Bell, Harter Fell, Kentmere Pike, Shipman Knotts. Over the previous week there had been more fresh snow over Lakeland. Having glimpsed some of the Kentmere fells from other recent walks and having been advised that the horseshoe is a classic winters walk, I headed off to Kentmere. I arrived at first light, keen to ensure I didn't run out of daylight knowing that progress might be slow depending on snow conditions. 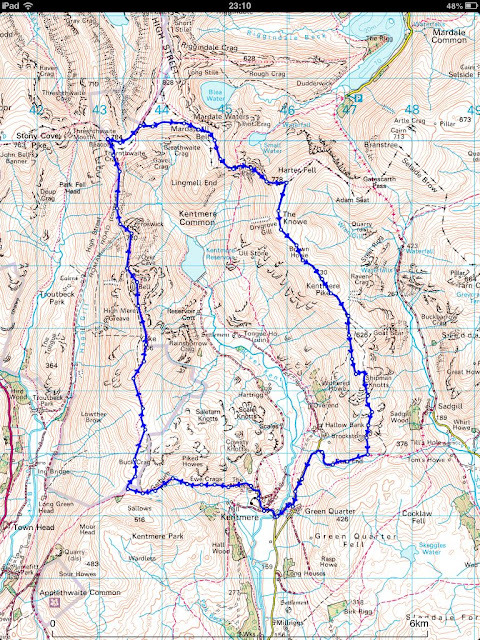 The horseshoe route is a classic, taking in 8 Wainwright fells. Clockwise seemed best to me as I knew the terrain on the west of Harter Fell was quite steep and would rather climb up rather than down if conditions were icy. Having parked in a farmers field with an honesty box by Low Bridge in Kentmere, I headed off towards the Garburn Pass. At Garburn Nook I left the Pass and headed north towards Yoke, the first objective for today. Despite Yoke's impressive profile the path upwards is a fairly gradual ascent with great views east over the Kentmere valley and west over the Troutbeck valley. Yoke summit is fairly flat with a pile of rocks to denote the top. Views are good all round but the eyes are drawn northwards to the impressive looking Ill Bell. Other than a biting wind the weather was perfect and the route onwards to Ill Bell was clear and inviting. The summit of Ill Bell is an expansive rocky plateau adorned with 3 large summit cairns. Why three? I have no idea but the views from each are excellent. This summit is well worth exploring. The next fell is Froswick which requires a short and steepish descent and then a gradual climb to its summit. Despite its lesser height, the views from Froswick seem superior to Ill Bell, mainly because its small summit does not impede the sight-lines in any direction. A short video from Froswick summit. The snow deepened on the path to Thornthwaite crag making progress rather slow. I quickly learned that the best way of walking on this snow was to either high step in other peoples footprints or better still to go off to the side and walk on untouched snow which had a crust just firm enough to support my weight. Snow near rocks, grassy tussocks or drifts would collapse under foot and I would soon be labouring up to my shins. Anyone who has not visited Thornthwaite Crag before will no doubt be surprised and impressed by the huge summit beacon which must stand about 15 foot tall. After a short coffee break I followed the path, or rather a line of footprints, northeast towards High Street but having climbed it before, and discovering it is not a particularly good vantage point, I veered off eastwards towards the next objective, Mardale Ill Bell. I was now at the apex of the horseshoe and the views north over Hayeswater and south back down the Kentmere valley were stunning. Hayeswater and Place Fell beyond. Looking back over to Yoke, Ill Bell & Froswick. Mardale Ill Bell summit is a rocky area with great views to the north over Haweswater. The views south are somewhat impeded by high ground. The route onwards to Harter Fell is steep in places descending to the col and very steep in places on the ascent to Harter fell. It was at this point when I put the crampons on and donned the ice axe. Although the way south towards Kentmere Pike looked easy enough and crampons were no longer required, the snow was shin deep and with a thin crust which sometimes would take my weight and other times not. This section proved to be the most awkward part of the walk. South of Kentmere Pike the snow began to thin out and the going was easier. One more fell to go, Shipman Knotts. This was a great winters walk but it took me nearly 9 hours to get round, mainly due to the snow conditions. I will have to do the route again in summer to get a different perspective of this great horseshoe walk. There had been some further snow fall in the lakes over the last few days but the lower fells seemed clear. I had some free time today and wanted to tick off some of the less well known fells in the far south eastern region; namely Sour Howes and Sallows. Wainwright, in book two (far eastern fells) describes these fells as being "not strictly walkers territory" and of Sour Howes in particular he says "it is a fell with no obvious appeal to walkers, and few other than conscientious guide-book writers will visit its summit". Little was he to know that his future popularity would enthuse the 'Wainwright Bagger' to follow in his footsteps over these fells, despite his obvious lack of enthusiasm regarding their virtues. Having been somewhat less than inspired by AW's descriptions, I also intended to climb Wansfell, for which he was far more complimentary. It was therefore 2 walks today, both from the Troutbeck area. The first from High Green up to Wansfell and the second from Limefitt Park up to Sour Howes and Sallows. Now regarding Wansfell, there seems to be some confusion as to exactly which peak is the official Wainwright. Most folk who climb Wansfell, particularly from Ambleside, will climb 'Wansfell Pike' and be perfectly happy to admire the view before returning, but apparently having never climbed 'Wansfell' as Wainwright described it. Because further along the ridge to the northeast from Wansfell Pike is another peak identified as 'Baystones' on the OS map, but called 'Wansfell' in Wainwright's book. This is the higher fell and looking at his pictorial map, and the altitudes he refers to, there can be no doubt that Baystones is in fact the true Wansfell according to Wainwright and therefore the fell of interest to me. To further confuse matters an area called 'Wansfell' is also indicated on the OS Map a little to the northwest of Wansfell Pike. This 'Wansfell' is not illustrated on the Wainwright map and is, according to OS, of lower altitude than both Wansfell Pike and Baystones. Like I said - some confusion. The Nanny Lane Track is the main route from Troutbeck to the Wansfell region and is an easy going ascent along a good path. About halfway along its trajectory towards Wansfell Pike the path forks and I bared right towards Baystones. At this point the cloud base dropped and it started snowing. No views today, so both peaks bagged (in case of any doubt) I headed back down along the Nanny Lane track back to the car. A short drive later I found a parking place in a lay-by near Limefitt Park holiday village. 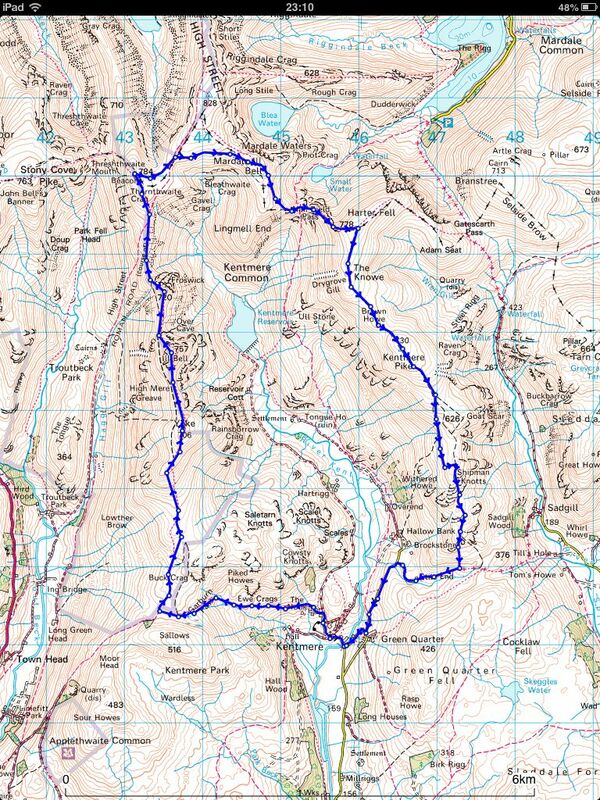 My route took me through the park to join a path which turns south to join the Garburn Pass. Shortly after joining the pass I noticed a stile in the wall on my right from which arose a vague path that seemed to head steeply in the direction of Sour Howes. I followed it upwards to a craggy area identified as 'Backstone Barrow' on the map. An indistinct path continues upwards towards the grassy mound of Sour Howes. I was soon back in cloud. The region is largely featureless and in the absence of views today, I trudged on. From leaving the Garburn Road I didn't see anyone until I rejoined it at the end of the walk. This is clearly not a popular walkers territory. On to Sallows next which is northeast from Sour Howes. I decided to take a direct route across the valley between the two fells rather than follow the wall which skirts a ridge to the western side. I couldn't see much due the low cloud but had visibility been better I would most likely have followed the ridge because I soon found myself labouring over an awkward terrain of grassy tussocks. Having finally negotiated the 'terrible tussocks' I gained the ridge to the west of Sallows and was rewarded with a view over the Kentmere Fells, the cloud having lifted a little. I then followed a path northwards to rejoin the Garburn Pass. The clouds had finally broken giving teasing glimpses of higher fells on the walk back down. By this time Wansfell had also broken free of the cloud. Perhaps I should have done these walks the other way round. The impressive looking summits of Yoke and Ill Bell, glimpsed from Sallows and the Garburn Road, convinced me that these would be the objectives for my next hike.